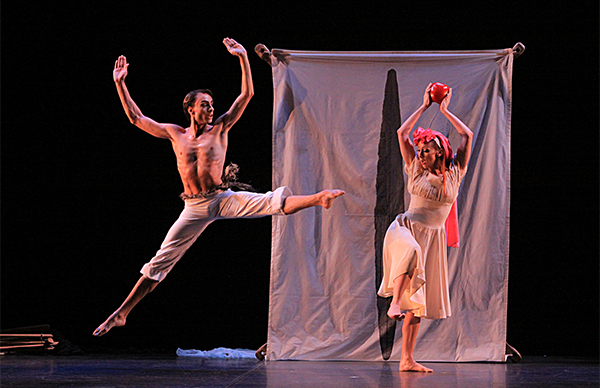 El Penitente was first performed in 1940 at Bennington College in Vermont, part of the renowned Bennington Festival. While the title refers to a sect of Southwestern American Indians that practiced purification from sin through severe penance, the dance itself bears no direct relationship to these practices. Constructed in the form of a play within a play, the dance presents a series of episodes from the Bible as enacted by a group of strolling players. On first viewing, the critic Walter Terry described the dance as a “dramatic ritual in which the figures of the Penitent, Christ, and Mary appear as leading characters. … simple and naïve with great dramatic episodes from the Bible retold with childlike reverence by the folk performers.” As originally cast, Martha Graham was the threefold Mary: Mary as Virgin, Magdalene, and Mother. Erick Hawkins was the Penitent, and Merce Cunningham was the Christ figure. Louis Horst composed the score for the dance (the last he composed for Graham), and Arch Lauterer created the original set, which was subsequently redesigned by Isamu Noguchi.